The accommodation was clean and had great amenities. Great location, local shops, restaurants. Location close to Port Aventura, excellent amenities within the apartment, safe surroundings. Apartments excellent. Washing facilities a bonus if travelling with children. Staff at centre helpful. Very clean, modern and well equiped apartment, lovely gardens. Feels very calm and safe (with security guard). The location of these apartments are perfect for families wanting to make the most of PortAventura Park . The facilities are great including a washing machine full kitchen and 2 bathrooms. The apartment was in a secure complex and was only about 7 minutes walk from the beach. It had enough cutlery and dishes to accommodate my family of 6. The pool was clean and was never over crowded. The air conditioning unit was excellent and very appreciated after the walk from the beach. We made a complaint about the shower flooding part of the apartment and a maintenance person was sent the next day to take pictures of the area (make sure you complain as soon as you have an issue to ensure return of your deposit). It was close to portaventura park and Ferrari land. It was also close to the beach and town centre. I like how it was near evrything and the place is clean. Lock in a great price for UHC Paradise Village Family Complex – rated 8.3 by recent guests! One of our top picks in Salou.Located just 1,650 feet from Salou’s PortAventura theme park, UHC Paradise Village Family Complex offers stylish, air-conditioned apartments. It has a shared garden with a children’s playground and seasonal outdoor swimming pools. Apartments feature a modern décor and furnished balconies that offer views of the gardens. Each one has a lounge area with sofas, a dining table and a TV, as well as a kitchen equipped with an oven, microwave and fridge. A private parking space is available for each apartment with an extra cost. The property is located in a quiet community area. Staff can arrange tickets for PortAventura and airport transfers. Salou Beach is a 15-minute walk away, and Port Aventura Golf Course is also nearby, at 0.9 mi from UHC Paradise Village Family Complex. Reus Airport can be reached in 15 minutes by car. 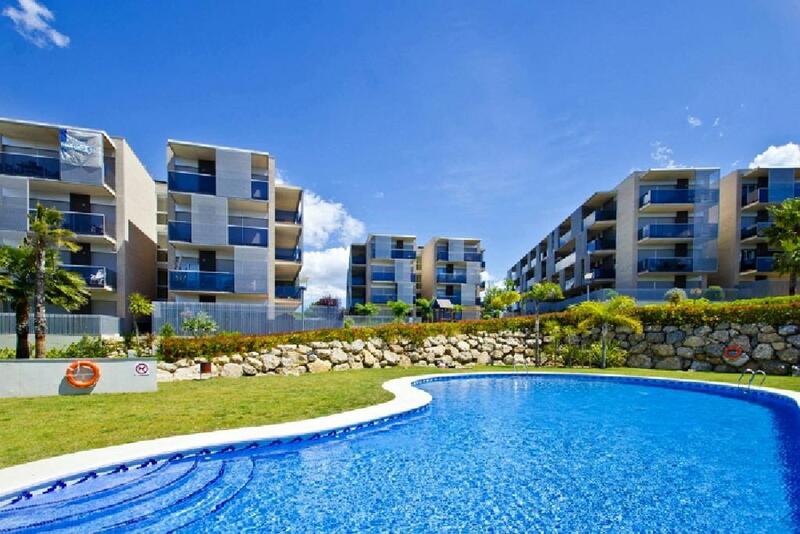 뀐 Located in the top-rated area in Salou, this property has an excellent location score of 8.9! When would you like to stay at UHC Paradise Village Family Complex? These air-conditioned apartments feature furnished balconies that offer views of the gardens. There is 1 twin room, or alternatively 1 room with bunk beds for 2 people, 1 double room and a sofa bed. The lounge area also comes with a dining table and a TV. The kitchen is equipped with an oven, microwave and fridge. These air-conditioned apartments feature furnished balconies that offer views of the gardens. There is 1 twin room, or alternatively 1 room with bunk beds for 2 people, and 1 double room. The lounge area also comes with a dining table and a TV. The kitchen is equipped with an oven, microwave and fridge. This apartment features a dishwasher, seating area and oven. House Rules UHC Paradise Village Family Complex takes special requests – add in the next step! UHC Paradise Village Family Complex accepts these cards and reserves the right to temporarily hold an amount prior to arrival. WiFi is available in all areas and you can contract packs of 1GB each with a validity of 24 consecutive hours at the extra cost of EUR 12 per pack. This service is contracted for the whole stay and cannot be split. You must pay a deposit of 120 EUR at the time of collecting the router in the office. This deposit will be refunded after departure. Please inform UHC Paradise Village Family Complex of your expected arrival time in advance. You can use the Special Requests box when booking, or contact the property directly using the contact details in your confirmation. Slight noisy family in opposite apartment each night between 21.00 - 23.00. Also possible suggestion, labelling the set of keys to make it clear which door each one is for. Should have been told pool at property was not available kids very disappointed. No beds around pool area. Key collection an hassle when travelling with children and luggage. No hair dryer. No balls/inflatables allowed around the pool - a shame for a family resort. It cost us €35 to pick up the keys from a box outside the office (out of hours) which I think is a bit overpriced to just key in a number. We had a ground floor apartment and the sitting room was very dark as the wall was adjacent to the entrance. I have seen pictures of other apartments in this complex and we had expected a brighter sitting room. Non apartment related issues - we were constantly washing down the patio as there were a lot of ants (people in apartments above also brushed their patios down onto ours). You share the property with permanent residents and some Spanish families above us thought nothing of slamming doors and screaming at each other at 7am each morning. Having to wait till 4pm to get into the property when we had an early morning arrival flight & no safe place for luggage (they are left in a corridor). The attitude of some of the residents (propert owners) & the pool man at the property. The location & security on the premises is great. The pool & surrounding areas are very well kept & clean. The UHC staff are very helpful.